Like other countries in the region, geographical position of Bosnia and Herzegovina is significant for the European transportation system. The shortest connections between the Central Europe and the Adriatic Sea run along Bosnia and Herzegovina. Bosnia and Herzegovina is a state which consists of two entities, Federation of Bosnia and Herzegovina (FB&H) and Republika Srpska (RS), and Brcko District as a separate major administrative unit. The Constitution of B&H reserves certain decisional competences to entities in a number of areas, including transport and infrastructure. Furthermore, FB&H consists of ten Cantons, and each of them is entitled to some competences regarding local transport and infrastructure. Total length of the road network in B&H is 24,796 km. Part of the BiH road network assumed strategic international relevance, within the Western Balkans region, due to its inclusion in the SEETO (South East Europe Transport Observatory) Comprehensive network. The Comprehensive Network identified under SEETO Memorandum of Understanding, shall be considered as a multimodal regional transport network which is the base for the implementation of the transport investment programmes. Furthermore, on 27 August 2015, during the Western Balkans 6 (WB6) Summit held in Vienna, WB6 representatives and the European Union reached an agreement on the indicative extension of the Trans-European Transport Network (TEN-T) to the Western Balkans. As a result of this agreement, the entire SEETO comprehensive network is now integrated into the TEN-T network; consequently, the related TEN-T maps were updated accordingly. Besides the Pan-European Transport Corridor Vc, extending through Bosnia and Herzegovina, the country’s transportation network is strategically significant for the Western Balkans region due to its inclusion to the SEETO Network. In that respect, the Comprehensive Network, as identified by the SEETO Memorandum of Understanding, should be regarded as a multimodal regional transportation network that forms the basis for the implementation of investment transport programmes. The Pan-European Transport Corridor Vc stretches from Hungary, through Croatia and Bosnia and Herzegovina, all the way to the Adriatic Sea. In its largest part it runs through the territory of Bosnia and Herzegovina, making it the country’s most important transport corridor. The Corridor Vc route goes along both BiH Entities, whereas 85% is on the territory of the Federation of Bosnia and Herzegovina and 15% in Republika Srpska. The Corridor Vc motorway route is designed in accordance with all standards, with two separate carriageways, each with two traffic lanes for each direction and one emergency lane on each side of the carriageways. Up to this date, 92 km of Corridor Vc motorway has been constructed and fully operational. Currently the construction works are on-going on three separate sections, as well as the construction of a bridge over the Sava River, where the Corridor Vc is crossing the border and continues along the territory of Croatia. Out of 1.030,389 km of railway lines in Bosnia and Herzegovina, 91.48% are single-track and 8.52% are double-track lines. The network is deployed 57% in FBiH, 40.4% in RS, and 2.6% in BD. The entire network is based on a standard gauge (1,435 mm) and the majority is single track (92%). More than 85% of the network is now classified as D4 in terms of UIC load categories, allowing maximum loads of 22.5 Tonnes per axle or 8.0 Tonnes per linear meter. Around 76% of the network is electrified with a mono-phase 25kV, 50HZ AC system. The railway network consists of two main strategic lines, which are also the main railway lines for cargo: The North-South line Bosanski Samac-Doboj-Zenica-Sarajevo-Mostar-Capljina, located on Corridor Vc; The West-East line Dobrljin–Bosanski Novi-Banja Luka-Doboj-Tuzla-Zvornik which is the railway line parallel to Corridor X. There are certain limitations in respect of the speed and safety of railway traffic oin the BiH railway network. These are mainly due to the unfavourable geographical configuration, incomplete safety system at stations, outdated signalling, lack of protection at level crossings etc. There are four main airports (international airports): Sarajevo, Mostar, Banja Luka and Tuzla. With regard to the water transportation, in the region of Neum at the Adriatic Sea Bosnia and Herzegovina has 24 km of the coastline, which has been developed as a tourist area. When it comes to inland waterways, the Sava River, as a border waterway, deserves a special attention because it is a valuable economic potential, particularly in terms of navigation and providing conditions for economic transport of goods. Passing through Bosnia and Herzegovina, on the one side the Sava River connects the Republic of Croatia and on the other side the Republic of Serbia. 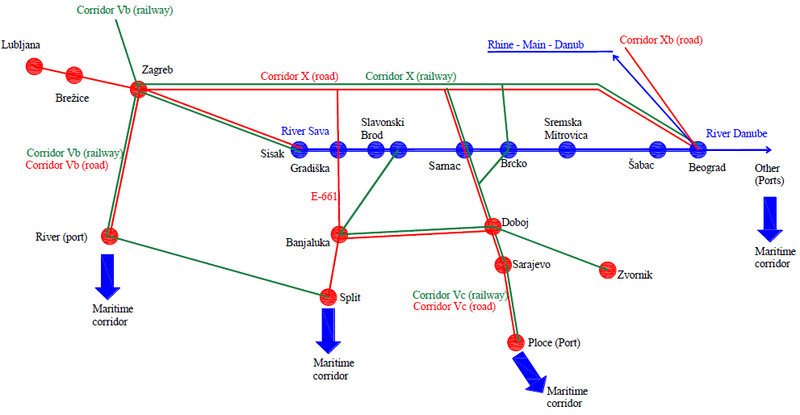 Given that the Sava River is the tributary of the Danube River, the water transport is connected with the Danube through the Sava River. Thus, Bosnia and Herzegovina is included in the European Inland Waterway Network, giving the geopolitical position of Bosnia and Herzegovina larger significance. It is worth noting that the Sava River once had the navigation Class IV in the section between the mouth of the Sava River into the Danube upstream all the way to the Port of Brčko, navigation Class II from Brčko to Brod, and Class II upstream all the way to Rugvice in Croatia. Such classification is in line with the European Agreement on Main Inland Waterways of International Importance (AGN). The total length of the Sava River inland waterway (Croatia/Serbia/BiH) from Belgrade to Sisak is 593 km. Through the territory of Bosnia and Herzegovina, the Sava River runs in the total length of 332.4 water kilometres. The river part through Bosnia and Herzegovina runs from its 175th river kilometre to 507th river kilometre, through the Federation of Bosnia and Herzegovina, Republika Srpska and Brčko District. The largest share is in the Republika Srpska (61%), in the Federation of BiH (32%), and the remaining 7% are under the responsibility of the Brčko District of Bosnia and Herzegovina. Bosnia and Herzegovina is a Signatory State of the Agreement on the Establishment of the Transport Community in the area of road, railway, inland and maritime transport aimed toward the development of transport network between the European Union and Signatory Parties. Transport Community should be based on the progressive integration of transport markets of the Signatory States of the South-East Europe into the transport market of the European Union based on the valid legal history enclosing the area of technical standards, interoperability, safety, security, social policy regarding the traffic management, public procurement and environment, for all transport modes excluding air transport.